You’ve landed! The interviews went well; you established rapport with the hiring manager; and here you are, with a perfect new job. However, the statistics about new employees keeping their jobs are very sobering. According to a recent article in Time magazine, almost one employee in six quits a new job within six months. That’s nearly 17 percent. Even more startlingly, 15 percent make plans to quit or quit outright within the same period. Why? The answer is simple. Employees cite “on-boarding” concerns — or, to quote Time, “in plain English, that means your new boss or HR department does a horrible job orienting you and getting you up to speed.” In a time of budget cuts and lean staff, on-boarding and training are some of the first areas to be cut. The good news, though, is that you can use your knowledge of these statistics to help you retain a job and thrive within it. First, concentrate on making your mark in the first 90 days. As US News and World Report writer Ritika Trikha notes, 90 days is the standard period in which a new employee’s contribution is measured. Time and US News and World Report suggest the following steps in taking an active role in on-boarding and ensuring a smooth transition in the new job. Think of them as a lucky number seven in managing your transition. #1 – Show initiative. “Ask how you can prepare, request materials to review and speak directly with future team members,” advises Time. It can be very useful to ask about people you should reach out to in the opening days of the job. #2 – Don’t be afraid to ask questions. Companies would rather have questions than misunderstandings. Also, ask directly for feedback. An absence of feedback does not necessarily mean everything is going well in some corporate cultures. And, you can use your questions to specifically target what your employer most wants in performance. 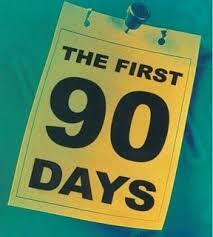 • What does he or she absolutely need you to do within the first 90 days? • What would he or she like you to do beyond that during the first 90 days? • What would he or she consider world-class performance during that period? #5 – Observe the company culture. Organizations differ enormously in style and social customs. Does everyone in your department watch The Big Bang Theory on Thursday nights? Or is there a key group that is passionate about soccer? Become knowledgeable about important commonalities like this and join in the discussion the next day. #6 – Manage expectations. Every position comes with some kind of learning curve, especially if some functions are new. Do not fake it until you make it, advises Ritika Trikha. Provide reasonable feedback about where you are on the learning curve, otherwise the expectations of your company will be ahead of what you can actually deliver. #7 – Approach people with friendliness and courtesy. Be sure to reach out to people. Accept any lunch offers than come your way! Also, be sure to thank everyone for their help. Quality Assurance is also the first thing to get cut during budget cuts. Most directors figure if they can’t sell it then there is no point to continue high end spending on QA when in fact the opposite is true. Keep contributing when the bad news strikes as it will in a bad economy. Ask your customer to write in or fill out your company QA survey about the services they are receiving from you.. Put your name on the survey for the customer since they won’t recall it anyway. If a customer is truly delighted they will take the time to write a letter to your boss about you. I’ve used this procedure for on-boarding and received CS-awards. By keeping your profile in constant view of your supervisors over that of your peers. If your not confident about your new job yet seek out a coach from someone who knows the ropes. Just forget about mentoring they usually never have time, but a coach will establish a commitment with you. They have something at stake usually you will take over work from them or perhaps your work will affect their performance review. It’s real important to know where you stand on the corp ladder. Don’t be afraid to ask a person 1 or 2 levels above you to be your coach. Most seniors love to give advice and will feel open to helping someone whom appreciates them.